We’re down at the Core Bike Show, right near Silverstone. 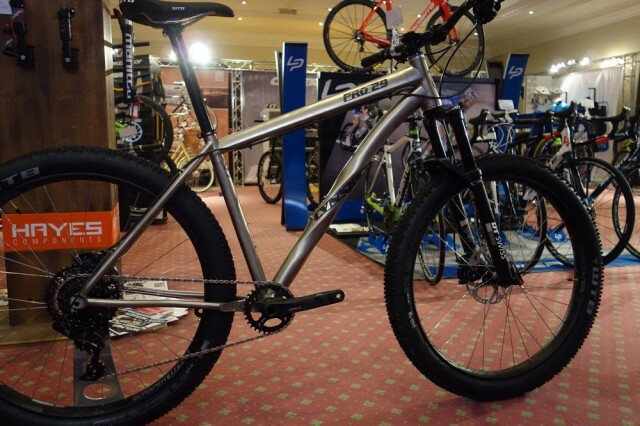 It’s a yearly UK bike show that kicks off the year of shows and product launches. With many of the UK’s top independent distributors and a load more top brand managers flying in from all over the world, it’s a great chance to see what should be landing in shops any day now – plus a few glimpses into what we’ll see later this year. 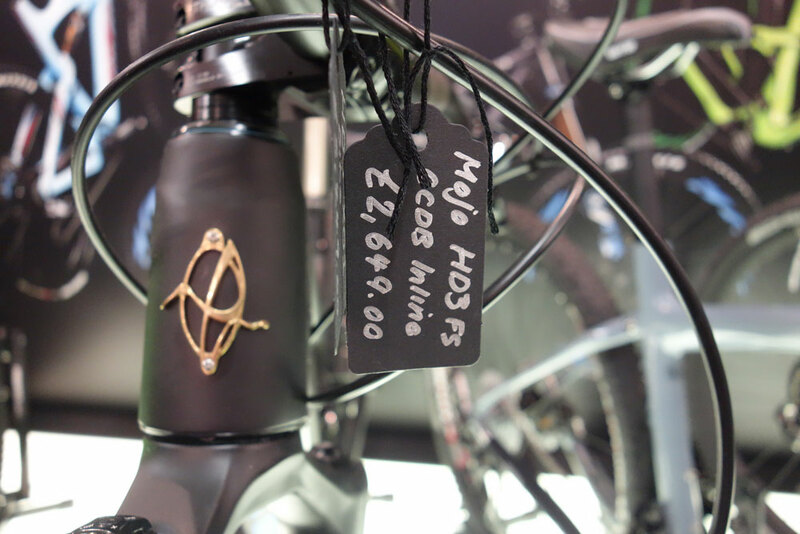 The Ibis HD3 has finally made it to the UK and will be available in three builds, with each bike coming with the Cane Creek DB Inline shock. Colours initially will be blue, green and black. 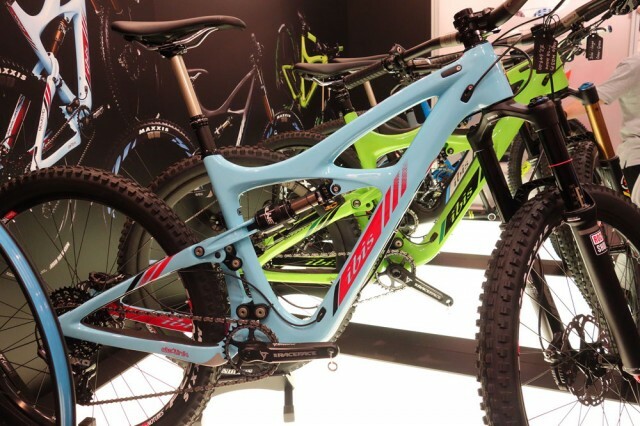 Ibis makes carbon wheels in a 41mm width for 27in and 28mm and 41mm for 29ers. 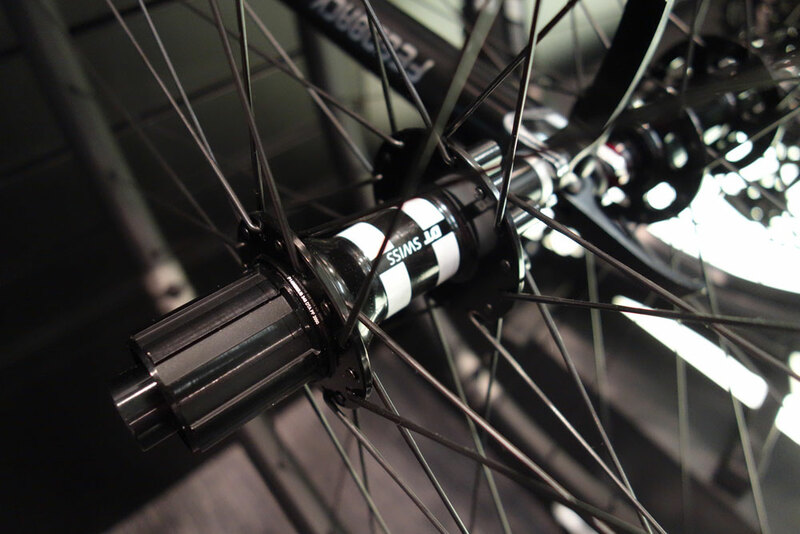 The wheels have just been upgraded to DT 340 hubs. Rims will be available soon too. 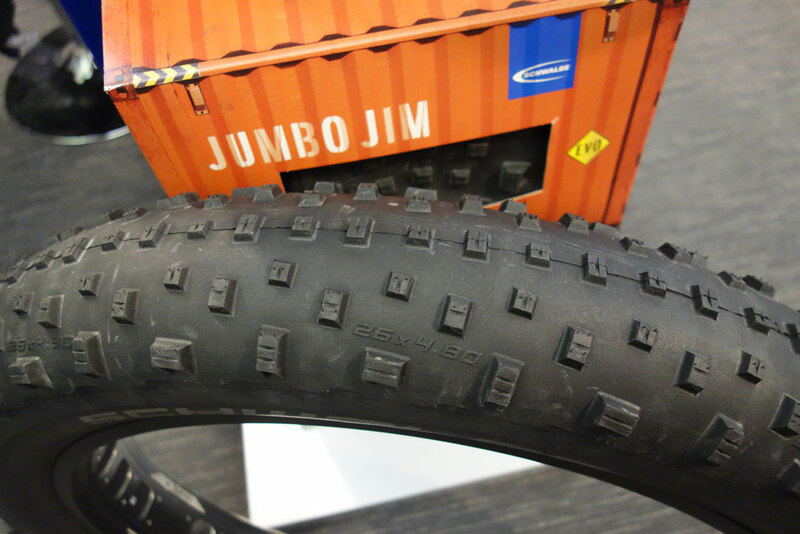 Those Germans have been busy, coming out with the Jumbo Jim fat bike tyre (in 4in and 4.8in) as well as the ‘might change things’ technology of ProCore. Big with widely spaced knobbles. Ideal for the UK? ProCore is Schwalbe’s take on a technology that’s been around on motocross bikes for a while (and was introduced for mountain bikes years ago with Bob Seals’ ‘Pop-not’ spongey inner tube supporter.) The idea is to have a road inner tube inside a very thin, light inner ‘tyre’ (the blue bit) running at a high pressure. 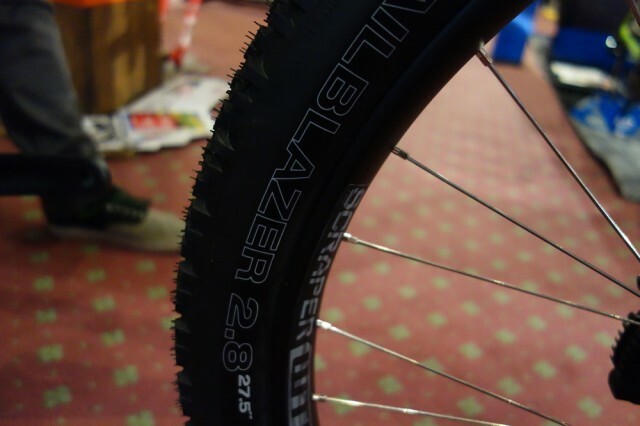 The outer tyre can then be run (tubeless) at silly low pressures without danger of hitting the rim on the rock as it’s protected by the high pressure inner ‘tyre’. The clever/difficult bit has been in working out how to pump up the tyre. Initial prototypes showed two valve stems, but who wants to drill holes in their rims? 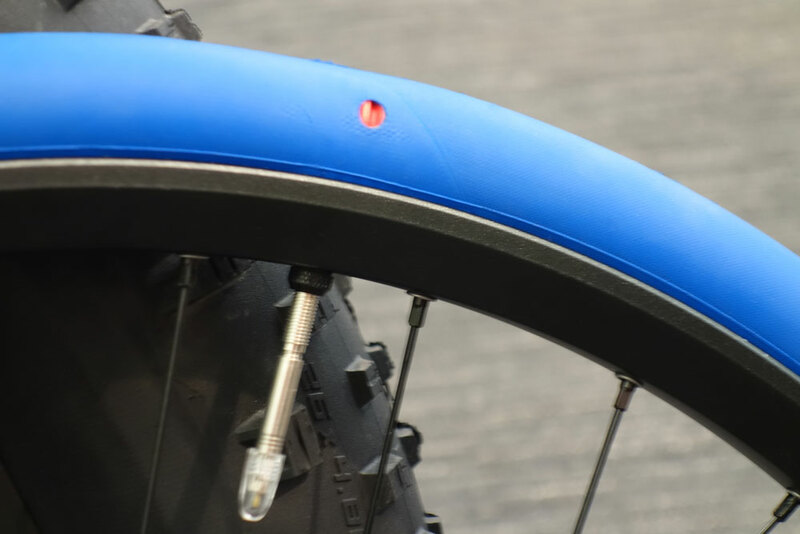 The new version runs a new valve that will pump up the inner tyre/tube and then, with a couple of twists start inflating the outer tyre through that hole in the blue inner tyre. We look forward to getting our heads round this this spring. Big valve will pump up both tyres. The outer tyre runs sealant for flat fixing too. And last, but not least, there’s a new Nobby Nic out from Schwalbe. 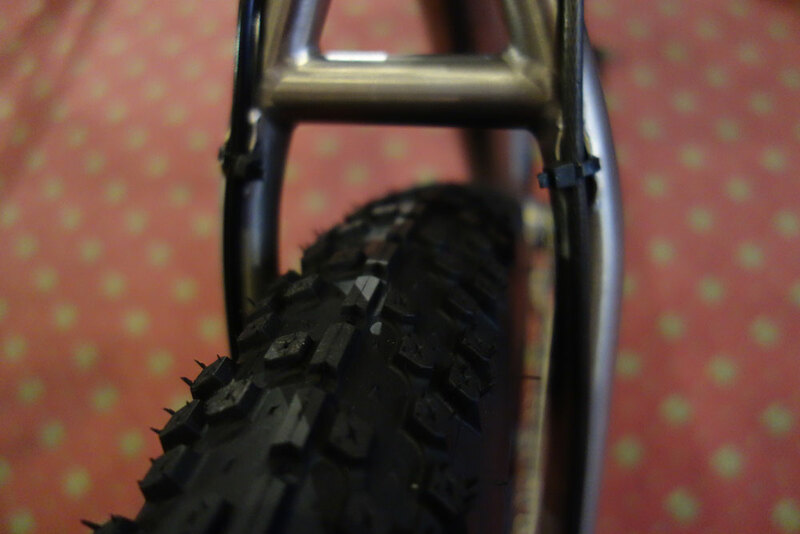 Better tread coverage, siped knobs for better grip. Should be a good all-round tyre. 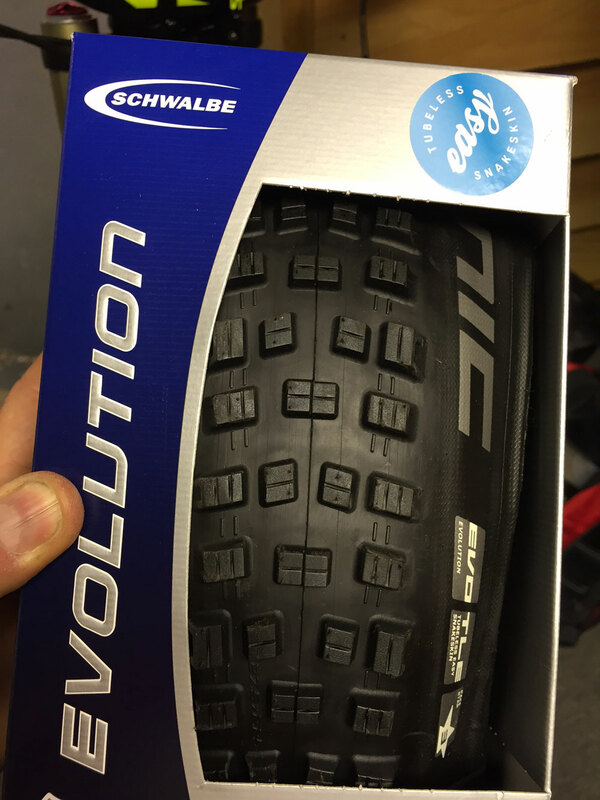 It’s also ‘Tubeless Easy’ – which means that it has Schwalbe’s snakeskin sidewall as standard, which should make sealing it tubeless simpler than with the thinner racy sidewalls. Here’s something they didn’t have at Eurobike. 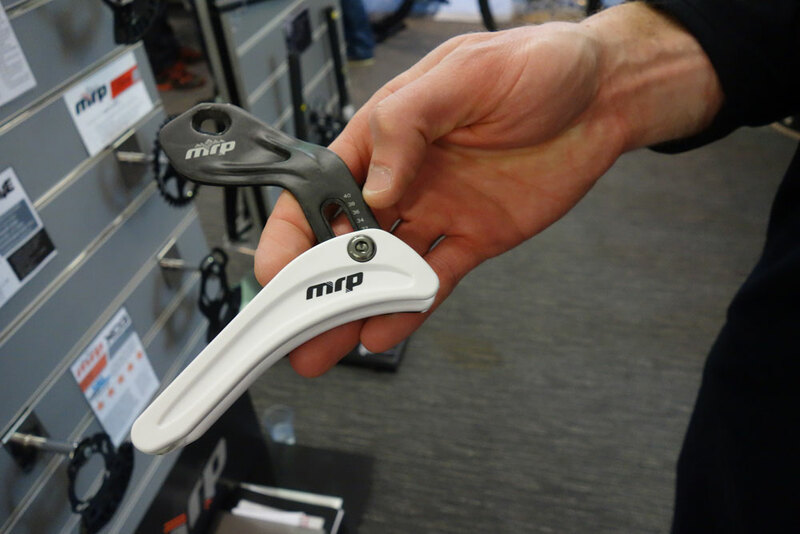 The MRP high direct mount chain device has a light, carbon plate that comes on and off with a single bolt. So you can slip on the device for racing and then, with a couple of bolts, just whip it off for trail riding. Or just leave it on. WTB and the (650)B+ thing. 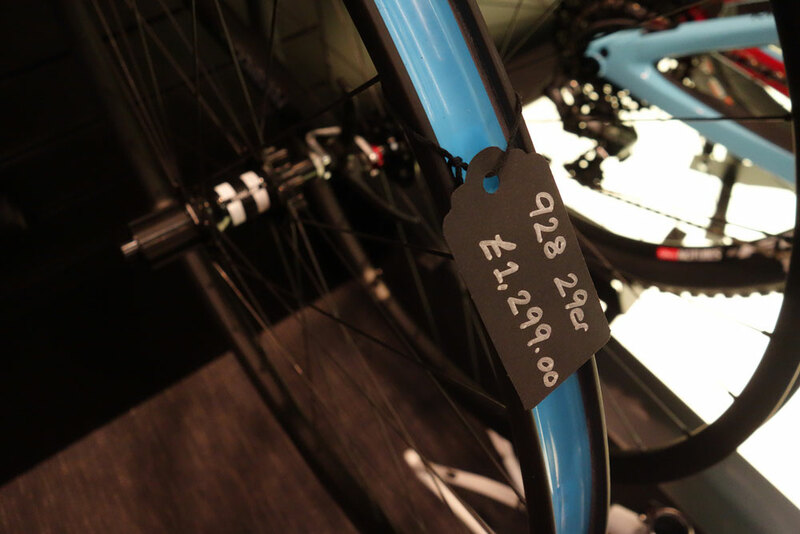 The buzz at the moment, isn’t 27.5in wheels (they’re sooo 2014) and it’s not even 29 x 3in (29+) – no, expect to hear a lot more about 27.5in wheels with 2.8 tyres and wide rims. 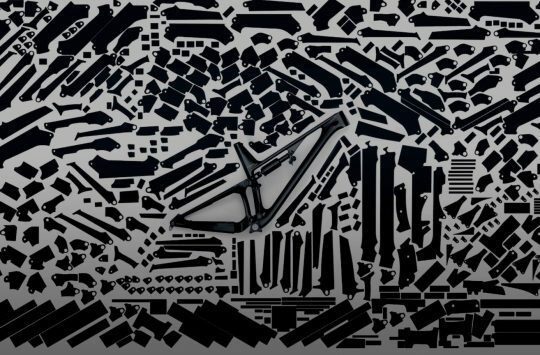 They’ll fit (mostly) into a 29er bike, but offer huge amounts of rubber, tread, cushioning and traction. While we’re not convinced yet (having never ridden one) we know that there are many big players poised to make this their next big thing. A lot. That’s a lot of meat – but still some clearance. Yay! 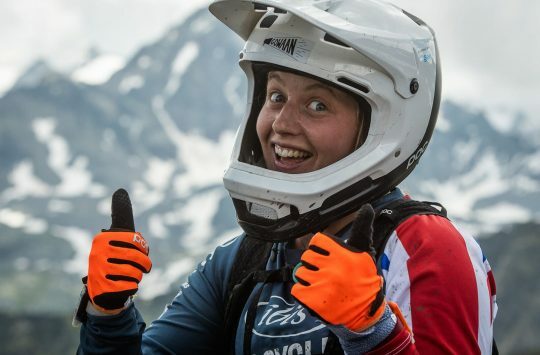 B+ at last, bring it on! Would love to try the new Schwalbe kit. 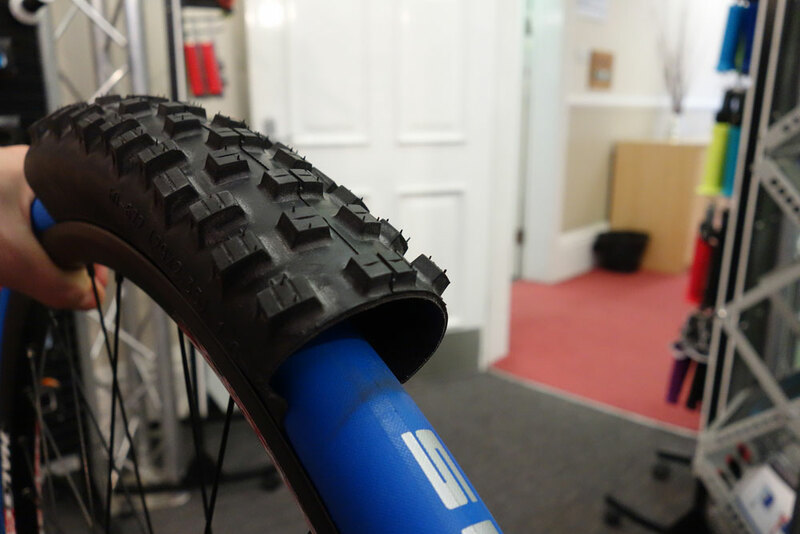 The Schwalbe Procore look interesting, as Eccentric said would love to give em a go.